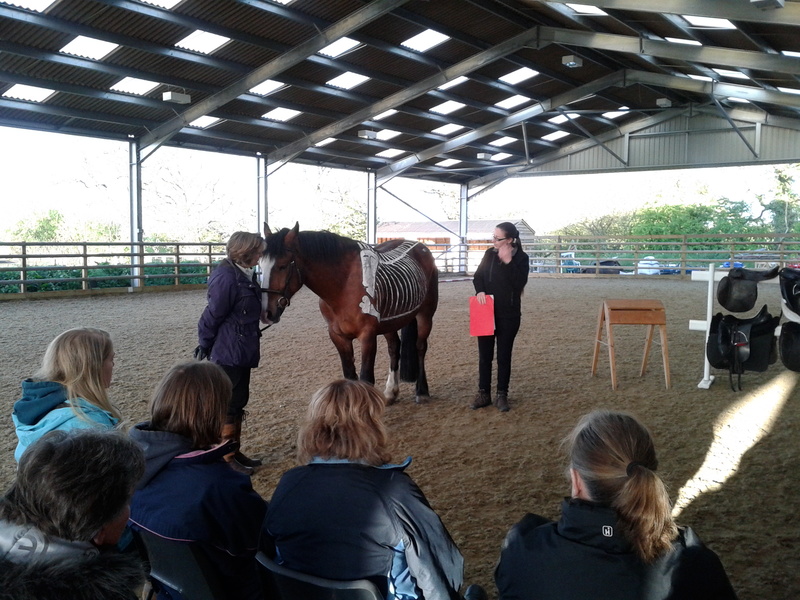 Lorna Kettle (Equine Body Worker) of Happier Horses and Lisa Pritchard Centred Riding Instructor (L2) of the Modern Horse talk about the importance of saddle fitting at a recent New Barn Riders lecture. 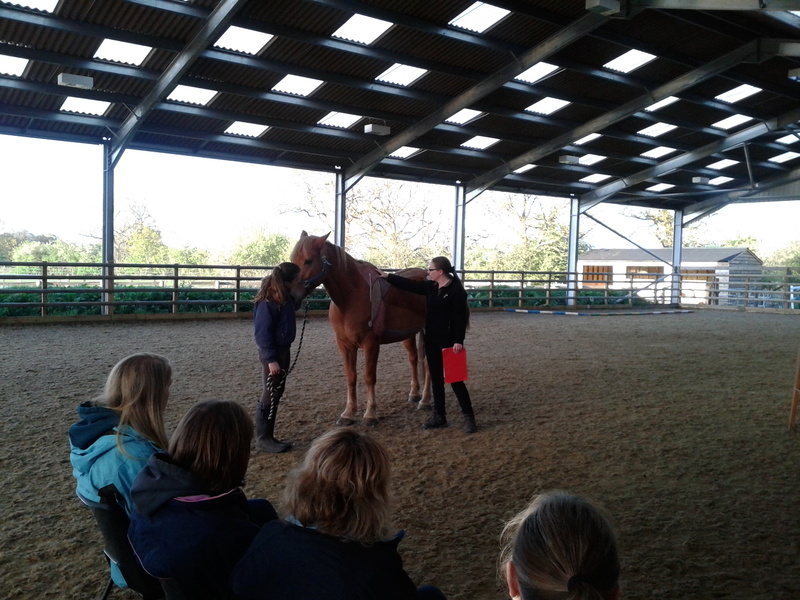 Lorna, who specialises in equine massage, began by explaining why it’s so important for the saddle to fit the horse. 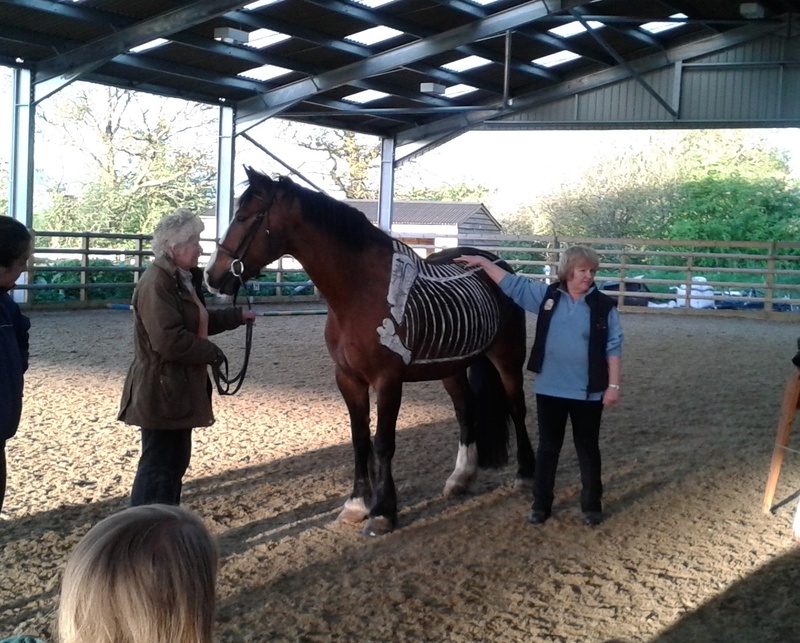 “Horses have no collarbone – the shoulder’s attached by muscles only,” she explained. “The horse has a long back muscle, connecting one end of its body to the other. When the horse plants its back legs this means it pulls its front legs up into a rear, and if planting the front legs, it can produce a buck. This muscle attaches to the pelvis along the spine, and also to the neck, harnessing the power at the back end of the horse to the front, so it must be loose and flexible. When riding, that long back muscle has to be raised and engaged, yet long and loose. “In order to raise the back muscle and work properly, the horse must use its abdominal muscles, which attach the front ribs and breastbone to the pubic bone. When these muscles are contracted, it causes the horse to contract like drawing a bow and arrow. In order to raise its back, the horse needs to step under with its back legs, which it can’t do if the back muscles are tight. If the muscles are too tight to allow the horse to tuck its pelvis under, it has to overuse the other joints such as hocks, which leads to problems, this can even sometimes be seen in high level dressage horses. The neck should be capable of stretching and lifting at the base, which will lift the forehand. The poll must be relaxed, allowing the horse to flex naturally. Riders who force a flex at the poll will only succeed in preventing their horse from stretching properly. “The points of the saddle must be positioned far enough behind the horse’s shoulder blades to allow them to move. The saddle’s quite inflexible, and the horse’s back is flexible. “To function properly, the muscles must have a good blood supply and enervation – a restrictive saddle can potentially cause muscle wastage. A sign of this is finding dips behind the withers upon removing the saddle. If the saddle is too narrow, the points will press into the back, and if it’s too wide, it will tend to rock forwards onto the points anyway. The flaps are less important, as the horse’s shoulders can move freely underneath them. Lisa then took over to discuss the rider’s anatomy and saddle fitting, and why it’s so important for the saddle to fit the rider. “The saddle should never be positioned further back than the last true rib, so a big rider in a big saddle on a medium size horse can cause problems with weight positioning, as the saddle extends too far back,” she said. Horses for courses…and saddles for riders. 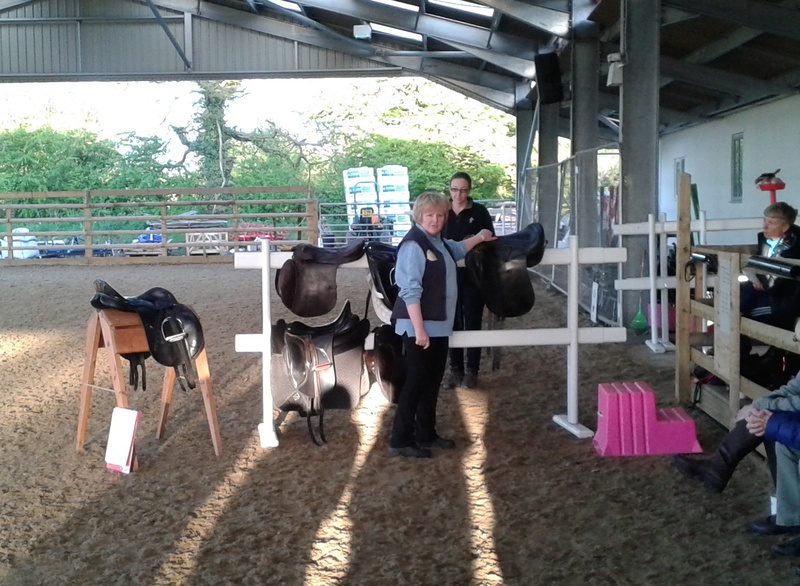 Lisa brought in a selection of saddles to show to the group, including conventional, balance, treeless and dressage. “Modern horses are wider, cobbier and generally chunkier than riding horses traditionally used to be, as they tended to have a lot of thoroughbred blood. Older books on horse care were more preoccupied with the problems caused by a saddle that was too wide, whereas nowadays far more problems are caused by tight, narrow saddles. As modern horses are also differently bred and better fed, it’s led to a new range of problems. “In addition to being comfortable for the horse, the saddle must also fit the rider. Traditional astride saddles were originally designed to fit male riders – the only saddle actually designed for women riders was the sidesaddle, which allows a woman to ride in the same way as a man, with a completely neutral pelvis. Because of our anatomy, 90% of women riders can’t use our pelvises naturally when we’ve riding astride. “A dressage saddle has a deep seat, straight cup flaps and thigh rolls. These days, people have started to ride big moving horses such as Dutch Warmbloods, and they feel they can’t sit still in the saddle without a little help. Dressage saddles hold the rider in position with big knee rolls and deep seats. This position might be OK for male riders, as their different anatomy means that they sit differently in the saddle, with their legs below the knee roll. If you’re shorter in the leg, though, and your knee is wedged against the roll, that can block the movement of the knee reduce the efficiency of one of your main shock absorbers, meaning you can’t rise properly to the movement of the horse, so you’re always behind the movement. The horse will respond by starting to rush, or becoming stuffy. For more information, visit www.happierhorses.co.uk or www.themodernhorse.co.uk.